This is my version of a Stickley #708 writing desk (aka post card desk). It is made from QSWO and measures 40”w, 22” d and 30” h (36” with the stationary gallery). I made a few changed from the original to avoid structural issues found in the antique original. The legs are laminated with qs veneer so that the rays are visible on all sides. The desk is frame and panel construction. The stationary gallery is removable. 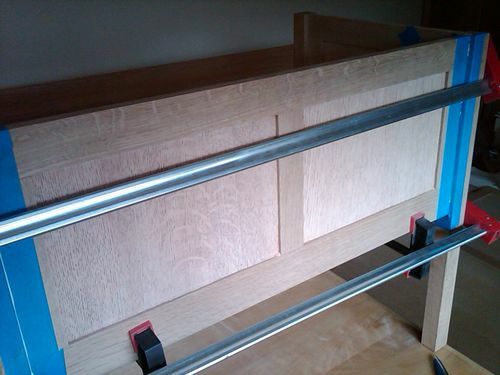 The drawers have machine cut dovetails. 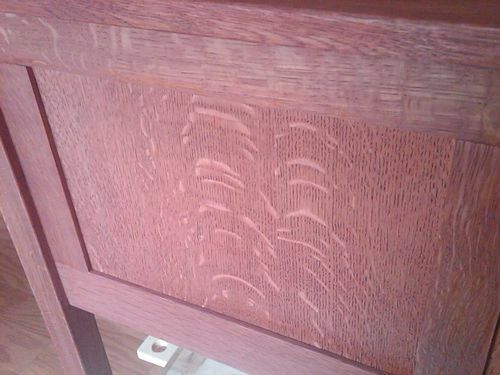 The finish is Trans Tint reddish brown dye followed by a seal coat of General Seal A Cell. The glaze coat is General Finishes Antique Walnut Gel stain followed by 3 coats of satin Arm-R-Seal. The desk is finished with clear Briwax. I sanded to 320 and 400 grit between finish coats and 0000 steel wool before the wax. Very nice. Love the style and the color. Great looking desk, I like the tall back panel. That should give the desk good strength over the years. Nice job on the finishing too. Did the color change much when you applied the gel stain? The final color looks more like the transtint dye than the antique walnut color. Looks great. The color after the dye step is almost a dark salmon/pinkish color. After the Seal A cell it is a bit darker and the rays pop a bit more. The real contrast comes after the glaze and topcoat. I was trying to match the color of my bedroom set. It used a walnut gel stain that is no longer available so color matching was a bit of a challenge. Nice job. Looks really nice. Looks like you were up o the challenges! Nice piece sir! On the issue of stains, I do am having to relearn new techniques with these new formula’s. I typically use 80 drops of reddish brown Trans Tint dye in 8 ounces of distilled water as my stock staining solution. I prefer the liquid dye since it dissolves instantly and does not require filtering. 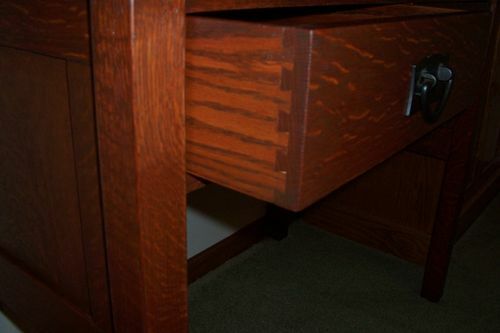 Use distilled water to avoid black stains on oak. That is a great looking writing desk! The finish is great—really pops that ray fleck! Vincent, what a great looking project! It almost makes me wish that I had a need for a writing desk. The grain is outstanding and your finish accentuates it well. Thank you for sharing. Very nice! I like the finish as well. Great job Vincent. The look is awesome as is the craftsmanship. Flush drawers always look better and you did a great job on fitting them. Another project to be proud of.